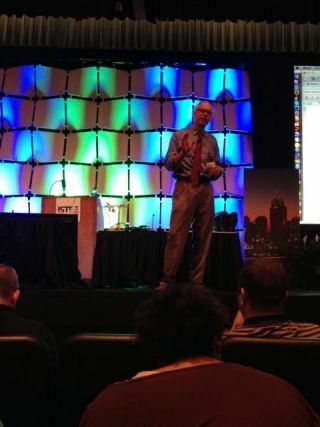 Every time I hear Alan November (@globalearner) present, I leave feeling motivated, inspired, and ready to take action! "The real revolution is not technology, it is the INTERNET!" Although I am a huge fan of the SAMR model, I LOVED that Alan's presentation challenged the idea of what "Redefinition" actually is. Many of us think that we may be "redefining" our lessons with digital tools, but which criteria do we use to assess ourselves on "Redefinition?" Alan suggested that "Redefinition" absolutely does not occur unless you can answer "Yes" to the following 6 questions. 6 Questions to determine if learning is transformed: If the answer is NO to all 6, then tech is suspect to "substitution"
1. Did the assignment create capacity for critical thinking on the web? 2. Did the assignment reach new areas of teaching students to develop new lines of inquiry? 3. Are there opportunities to broaden the perspective of the conversation with authentic audiences from around the world? 4. Is there an opportunity for students to publish (across various media) with an opportunity for continuous feedback? 6. Were students introduced to “best in the world” examples of content & skill? I absolutely LOVE Alan's 6 questions because I think this "question set" is the magic criteria we have been missing in the SAMR Model! True "redefinition" in the classroom is hard to attain, and it is important that we know what "redefinition" actually looks like in order to assess whether or not we have accomplished it! As I listened to Alan present, he hit the nail on the head when he dug into his definition of what teaching philosophy needs to look like today! He suggested that "our jobs used to be about giving students the information. Now, our job is to teach students HOW TO FIND the information!" Teachers are no longer the keepers of all knowledge. It's not about what you know anymore, it's about having the information literacy skills necessary to FIND the answers to everything we do not know! During the first 5 days of school, Alan suggests that it is essential to teach students how to SEARCH in your content area! "Web literacy is the new reading that must be taught in all content areas!" Amen, Alan! Just as we are all teachers of "Literacy" in our content areas, we are all teachers of "Web Literacy!" And really...there is no longer a difference between Literacy, Digital Literacy, or Web Literacy! Literacy is Literacy...and we are ALL responsible for leading our students through this journey together, regardless of content area! Next, Alan spent time demonstrating examples of how he would teach Web Literacy and research skills in his classroom. Here is something to consider: "Can you design a search that gets you the best information? If not, you have wasted the whole school year!" Alan used this example: If you are teaching your students about the Iranian Hostage Crisis, first ask them to find what it is actually called in the rest of the world. Just because we call it the "Iranian Hostage Crisis" in America, does not mean it has the same name in the rest of the world! Wikipedia is one quick resource that can be used to find quick information like this! We must then ask our students this: "Find me 2 legitimate sources about the Iranian Hostage Crisis from Iran." In a Google Search, students should be typing: ac.ir into the Google Search with the topic name! The "ac" is "academic," and "ir" is the country code for Iran. Likewise, if you are teaching about the American Revolution, have you asked the students to find credible resources from the UK's perspective regarding the American Revolution? Try typing: site:sch.uk "American Revolution" to start a Google search for all of the sites in the UK talking about the American Revolution! Alan asks us, "Teachers, are you asking the right questions? If not, you probably will not get the right answers from your students!" Are you teaching your students how to search with country codes? If not, you will get answers from a single perspective rather than from the perspectives of other countries around the world! Next, Alan showcased the amazing philosophy behind a math teacher's classroom website! On this website, Mr. Marcos leads his students to create math "how-to" videos, and shares them with the world. Not only do they share their videos, but they also study the statistics & analytics of their website traffic from all over the world! Some of these student videos have been viewed over 74,000 times from multiple countries across the globe! Alan talked about the ability of this teacher to now say, "Last year's students left a gift for you, and the gift is a library of tutorials that have been designed to help you learn every problem in this course! If you don't understand factoring, you will be able to find a factoring video created just for you on our classroom website!" Can YOU announce this the first week of school? If not, think about the powerful implications for learning that are created in this classroom environment! This is flipped learning at its finest! Let the kids help you flip the learning for other students! If you show kids videos of other kids teaching them physics, perhaps maybe you will generate more interest for physics! Alan also provided us with a high school example, and suggested that "kids will ask a friend for help before they ask a teacher. If you believe that kids are social, and that we have underestimated the contribution that kids can make to help other kids learn, then we should teach them to contribute their knowledge to help other kids learn!" Perhaps...just perhaps...a Global Audience can be more motivating than a teacher. Perhaps...just perhaps...students can motivate one another more than a teacher. I would like to challenge myself, as well as other administrators and teachers, to lead with this type of mindset: provide students the opportunities to lead both each other and students around the world! During the First 5 Days, Alan encourages us "to teach our students how to search, and how to contribute their knowledge in different forms!" We need to model "how we learn as teachers," so students can see that we really are lifelong learners! Have you shown your students "how YOU learn?" Perhaps you could show them YOUR blog, or how YOU create a library of resources that YOU use to learn more about American History. Alan suggests that "In the first 5 days, Teachers should show students how THEY learn! We typically demonstrate what we ALREADY know, what we have ALREADY learned...We must show students that we are ALWAYS LEARNING TO LEARN as well!" I would like to end this blog post with a reflection of my very favorite moment during Alan's presentation. Here is the quote that says it ALL: "Before the Internet, we taught content & skills. Now, we teach students to build a network. When you graduate, you will have a network connected to the world, following the best minds, and have a global voice...in addition to the content and skills. Build your own learning ecology!" Alan talks about the importance of each student discovering what it is that they are passionate about, and the necessity for teachers to show them how to connect with the best minds in the world related to their passion! Imagine a world where students graduate already following a Twitter network of professionals, already connected with a global audience, and already creating collaborative projects showcased in a variety of digital platforms! Alan, thank you for inspiring a nation full of educators! You are an amazing asset to the global education community, and we hope you know how truly valued you are! To find out more about Alan November and his "First 5 Days of School" ideas, please visit his website, follow him on Twitter (@globalearner), follow the #1st5days hashtag, and watch his TEDTALK video!